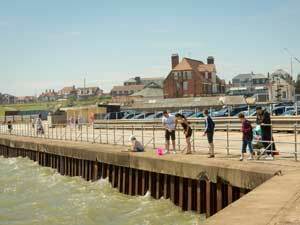 Tourist Information Centre Walk 19 at Gorleston Promenade/ExerciseTrail01493 846346work Walking RouteGorleston Promenade & Exercise Trail Walk is a 2.1mile (3.4 kilometre) circular walk starting at the promenade beside the Pier Hotel at the harbour mouth in Gorleston-on-Sea near Great Yarmouth. A walk along the promenade with views across the sea to Scroby Wind Farm and the Outer Harbour. There are several different options for refreshments along the route from The Pier Hotel to a number of smaller cafe's and retailers. Public facilities are available on South Pier near to the beach.